As word of a royal engagement spread, all of Britain seemed to fall under a magic spell. Romance warmed the heart of a weary world. "So there's something very appealing about that in a way in a world … where everything is churning. You've got this incredible renewing focal point of national glamour," said Tina Brown, author of "The Diana Chronicles" and "The Vanity Fair Diaries." "We just learned that Prince Harry got engaged!" Stephen Colbert, host of "The Late Show with Stephen Colbert" exclaimed. "But now I feel like we've got skin in the game baby!" said an excited Julie Chen on "The Talk." "I love your tweet after their engagement," "CBS This Morning" co-host Gayle King remarked to actor Wendell Pierce. "William and I are absolutely thrilled. It's such exciting news," future sister-in-law Kate told a reporter. "…And for me personally, I hope it means he stays out of my fridge, and stop scrounging off of my food like he did the last few years. So I'm pretty excited," joked Prince William. "We're thrilled, thank you so much, for both of them. I hope they'll be very happy indeed," said Prince Charles. Royal biographer Penny Junor told CBS News, "I think they're gonna sprinkle stardust wherever they go." "The phone rings … 'Is this Alexi Lubomirski? This is Kensington Palace calling.' And of course my initial response was … it was my best friend pranking me." The unexpected call came to the award-winning photographer, who has worked just about everywhere. "Had you had any dealings with Kensington Palace?" King asked Lubomirski in his only U.S. television network interview. "No. Nothing. No. No. No," he said. "And they said we'd love talk to you about a project. It would be great if you could come down to Kensington Palace ….and meet us." Lubomirski headed to a job interview to be the official royal engagement photographer. "They're just a young couple in love," said Lubomirski. "It's the most beautiful thing to see. And I'm a cheeseball so I love that kind of stuff." Lubomirski isn't a wedding photographer by trade. You're more likely to find him on a fashion shoot or in a remote location. A common bond was realized with Markle and Harry. "We sat down. We spoke about Botswana, because I grew up in Botswana. And Harry has a close connection to the country." And like Harry, Lubomirski also does humanitarian work in Africa, working with the charity Concern Worldwide. He also happens to be a Polish prince. "We had a secret handshake," he joked. "And then we spoke about the shoot." "How did you decide where it was going to be shot?" King asked of the engagement photos. "And what you wanted the look to be?" "We all wanted to create something new and different," explained Lubomirski. "I think that was very important for us. And very important for them." "And I said, 'You know, just wrap her up,'" he continued, snapping his fingers. "And then she turned around to him and there was this beautiful moment. They were hugging. And looking at each other and smiling." "What were your impressions of them both?" King asked. "Just lovely, young, normal people," said Lubomirski. "There's no doubt that engagement was a very different kind of mood. I mean William and Kate were charming, but formal. You go back, of course, to Diana and Charles, and it was famously awkward," said Brown. Harry showed Markle his world. "She once set off into the crowd. And she introduced herself. You know, "Hi, I'm Meghan." As if they didn't know who she was," royal biographer Penny Junor recalled with a laugh. "She adores him but he's so impressed with her. It's so sweet," said Brown. But for royals, "true love" wasn't always a plus. In fact, 80-some years ago it was scandalous, forcing King Edward to abdicate the throne so he could marry American divorcee Wallis Simpson. "It was an amazingly big deal," said Ingrid Seward of Majesty Magazine. "And it's a different world." And the monarchy has evolved. 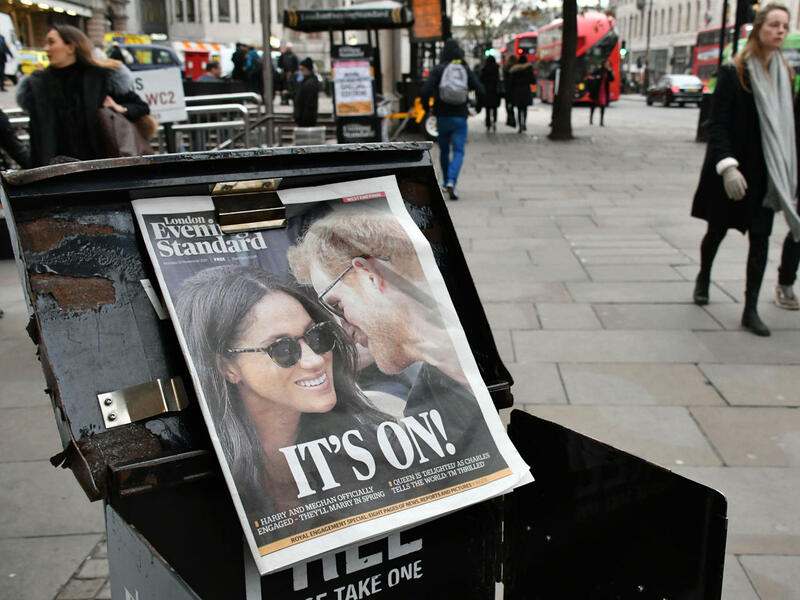 "Everything that could have gotten you beheaded 500 years ago … that's why this union …, has already brought the monarchy well into the 21st century," said Vanity Fair's Sam Kashner, who wrote the first major profile of Markle for the cover of the magazine. But in the 21st century, hatred and racism are still alive in Britain. Shortly after the engagement a suspicious white powder and racist letter was sent to Harry and Markle. "There are people in Britain who are violently and aggressively hostile to the idea of a woman of color marrying Prince Harry," said journalist Afua Hirsch, author "Brit(ish)."" I feel sorry for Meghan Markle that she has had to be the person that has drawn some of this ugliness out. …and I think in a way it took the hallowed institution of the monarchy becoming more diverse to reveal some of these sentiments that do still exist in Britain." "Of course it's disheartening. You know it's a shame that that is the climate in this world," Markle told the BBC. "…you know at the end of the day I'm really just proud of who I am and where I come from." And as for the House of Windsor and its current monarch, "The queen is delighted with this match, mostly because she just wants her grandson to be happy," said Kashner. "She saw Prince Charles' unhappiness." And how would Diana would have felt about Markle? "I think Diana would've adored Meghan," said Brown. "Adored her activism," said Kashner. "Adored her big heart." That heart that Markle has to make the world a better place. That same activism also defined The Princess of Wales. She, of course will be the missing guest. Yet all eyes can imagine her. Princess Di, proud mother, watching her baby Harry come down the aisle, with his true love by his side.